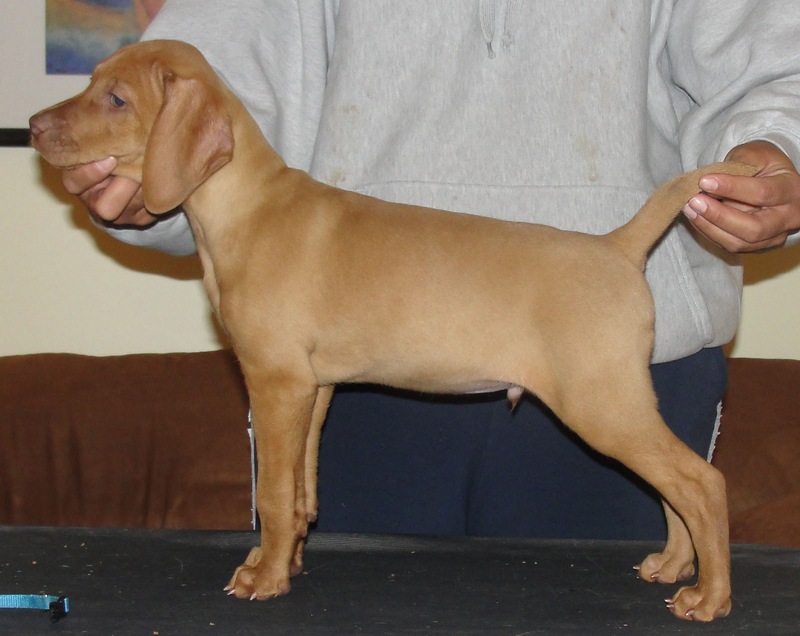 Windrunner Vizslas: Getting You Up To Speed - 8 Week Old Pupdate! Getting You Up To Speed - 8 Week Old Pupdate! Mea culpa for not posting for the last few days. Work, sleep and puppies have taken up my computer time! Imagine that? Tuesday the boys turned 8 weeks old! The time is flying by too fast for me. They are staying until right after Christmas but that is making me sad - at least for now. Soooooooo! What have they been up to? 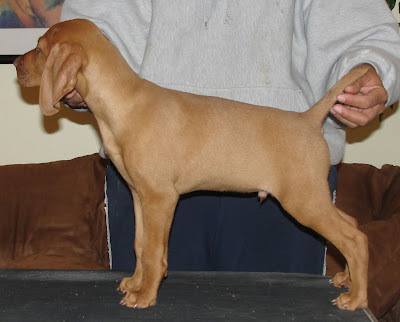 Monday we did a temperament test based on Sheila Booth's Positive Puppy Preview. Thank you Lianne for being the tester. This was her first one and she did a fine job! For those not familiar with temp testing, it is a series of activities to do with a puppy to "test" what it's personality is like. If you are getting a puppy from a breeder who doesn't spend a lot of time with the puppies (and who would get a puppy from someone like that?) 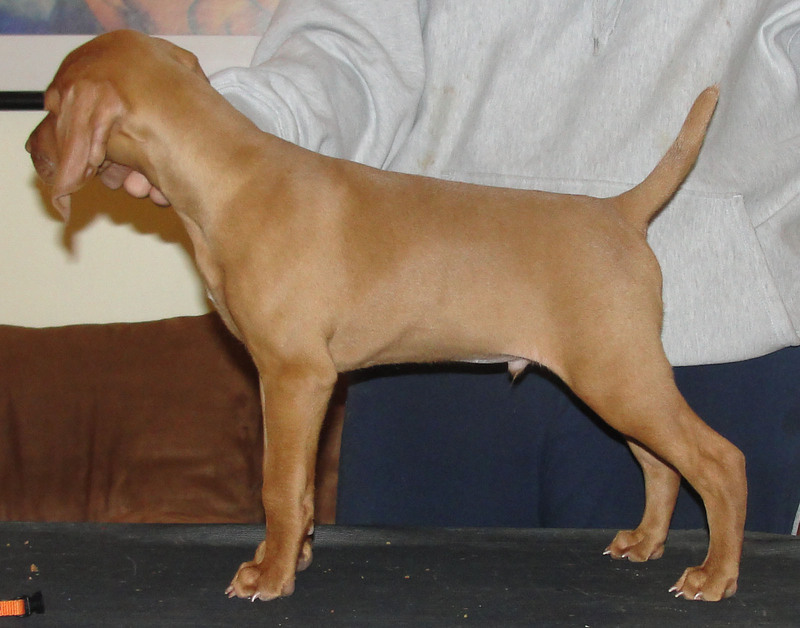 then a temp test is a good tool for giving you an idea of what the puppy might be like. For me I like to use the temp test as a tool to give a better idea of what the puppy might need to work on in its new home. I do think that a few parts of the test hold true to the puppy - sounds sensitivity and touch sensitivity. I have tested many puppies in several breeds and these seem to be the most consistent behaviors throughout the puppy's life. The boys were solid and pretty even in their testing as I expected. What they didn't show was their prey drive which is pretty decent generally. So, if I were the tester of this litter then I would advise pretty much ignoring the puppies' prey drive for this testing except to keep in mind that they like most vizslas can be easily distracted. They were very motivated by interaction with people - both with Lianne and at the end when they had to figure out how to come find me. No one was sound sensitive and Quick was the least reactive to touch. The video of the tests are at the You Tube link to the right. You'll hear the others screaming in the background but it was too cold to put puppies not being tested outside but I don't think they were too distracted by the noise. They hear it all of the time! Terri and her Granddaughter came over on Tues to help weigh them and have a visit. Also on Tuesday Caren came over to give me her opinion of the boys for a structure evaluation. They weren't very cooperative for stacking so that I could get pictures at the time. I just took some later. They do have minds of their own but at least they are very sweet when the want things their way - sometimes. Quick (blue) looks very stoic here. Jack (orange) is looking for an escape route.